Pictures are of a 2004 Dodge Stratus like the Chrysler Sebring – click on images for a larger view. 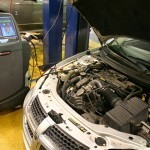 © DenLorsTools.com Summary: In this automotive repair blog, we provide some helpful information on how to R&R (Remove and Replace) the evaporator in a 2004 Dodge Stratus. 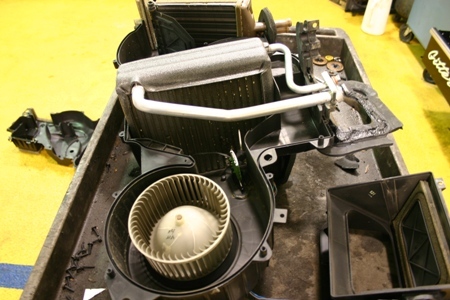 Replacing the heater core is basically the same job, except for the replacement of the receiver drier. 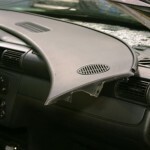 These tips are for the 4 door sedan, yes the the coupe and the convertible may be different depending on the year. If working on a different model or year it would be advisable to refer to an auto repair manual. 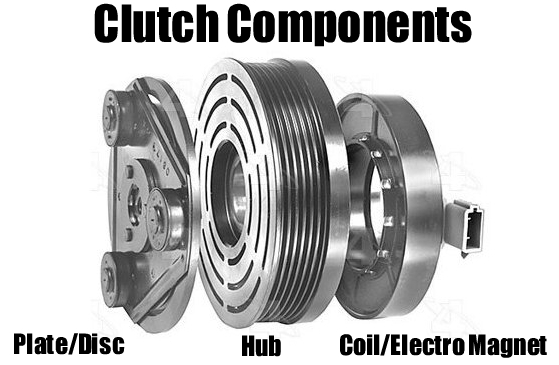 Auto repair manuals provide detailed info on changing components like the evaporator in any model. Just keep in mind that for evaporator or heater core replacement, most of them will say “see removal of instrument panel.” Which is accurate except for the fact that if all you’re doing is moving the dash to access the evaporator case, dismantling the dash isn’t really needed. 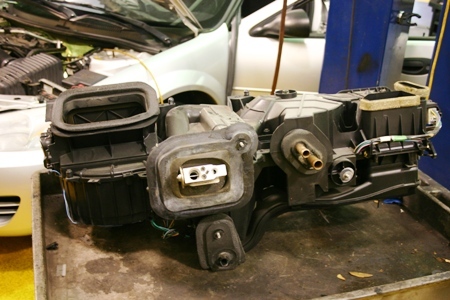 If the instrument panel is removed as described in most auto repair manuals, many more parts will be removed unnecessarily. After verifying the evaporator is the cause of the refrigerant leak with a dependable Freon leak detector, we’re ready to start. 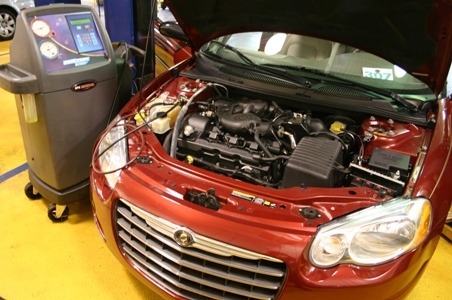 Remove the refrigerant with an AC recovery machine. If doing this at home, keep in mind the only legal way to remove the 134A is with a recovery machine. 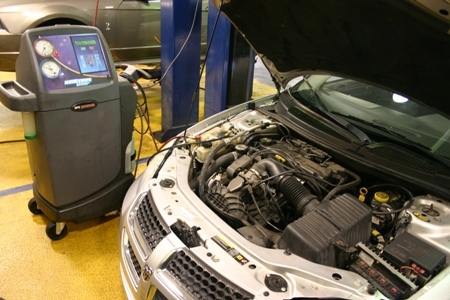 Some repair shops will recover the refrigerant and when the job has been completed and the car is taken back to the shop, they will pull the vacuum and recharge the system. I’ve done this before for customers, it wasn’t always my favorite thing to do since dealing with DIY’ers was a hassle because sometimes there would be leaks that the customer did not detect, they cut an o-ring, or some other part of the repair just wasn’t right. However if the work was done properly it was easy money for me, I would let the AC machine do most of the work and I would flag 1.4 hours. Disconnect the battery for safety when doing any dash work. Keep in mind that there may be some residual pressure left in the system, so when removing the first refrigerant line there could be a little refrigerant oil spraying out . Start on the outside, by removing the drier and disconnecting the lines going to the expansion valve. 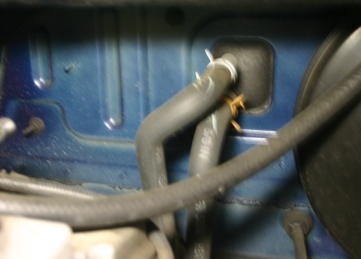 Disconnect the heater hoses with spring clamp pliers or a hose clamp cable tool. Pliers will work but sometimes access can be difficult. Next there are three ten millimeter nuts on the firewall that go to the evaporator case, those will need to be removed before moving on to the inside of the car to work. Wait until last to install the new drier since prolonged exposure to the atmosphere can contaminate the desiccant by allowing it to absorb moisture from the outside air. Pop the trim at the bottom of the doorways and lay them to the side. 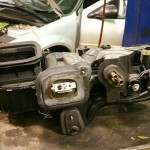 The screws that hold the kick plates can now be accessed and removed. Pull the weather-stripping away partially and drape them on the outside of the doors. The pillar trim panels are removed with a trim stick and pulling by hand. 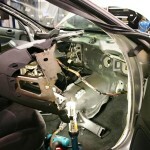 Then the large trim panel that runs along the top of the dash is pry-ed out carefully not to scratch any surfaces. 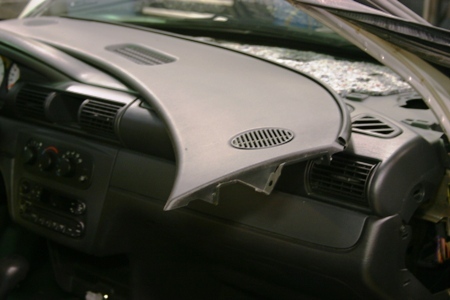 Careful working around the windshield, since a slip of a tool can crack it fairly easily. 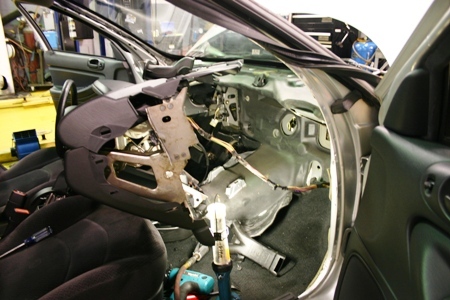 Remove the 4 10mm bolts and 5 Phillips screws along the top of the dash that are now exposed. 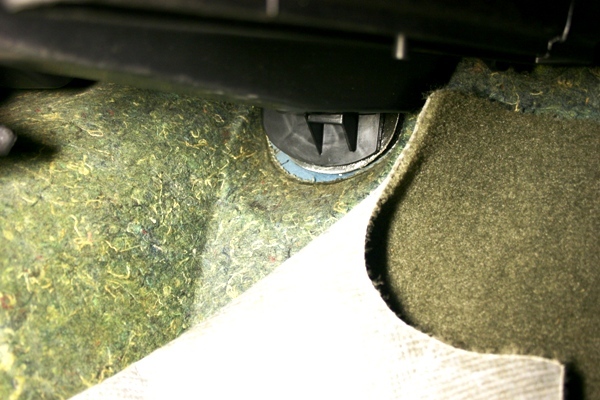 Remove the glove box by pressing in the tabs and swinging it down and un-hinging it. Remove two 10mm nuts securing the dash to the case. Remove the small trim pieces on each side of the hump in front of the console and then the two 10mm bolts that will then be exposed (one on each side). Remove the center console, by removing Phillips screws. 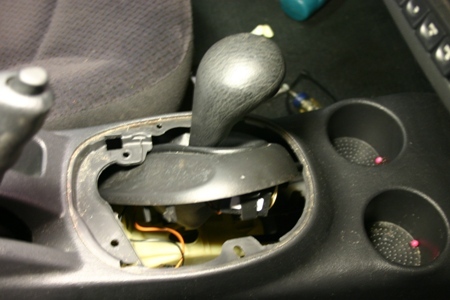 The shifter knob can be removed or the PRNDL trim can be popped up and turned sideways and the console can be lifted over the trim to extract it. Remove the power mirror switch and trim bezel, then the drivers knee bolster can be removed (one screw will now be exposed). The knee bolster is removed by taking out the Phillips screws. Unplug wiring that may not have enough slack when the dash is swung. Care should be taken not to move the steering wheel from center when the coupler is loosened. 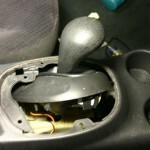 If the steering wheel is turned, the clock-spring for the airbag in the wheel can be broken! With this in mind, remove the steering coupler at the bottom near the floor using a T40 torx. To the right of the steering column remove the 10mm bolt that goes up to the evaporator case, also in this area unplug the wiring plug that goes to the case. Remove the stoplight switch (by twisting it counter-clockwise) this will prevent it from being broken from bumping it when the dash and case is swung out. The case stays attached to the back of the dash until the dash is swung out. Have a friend help swing the dash out by un-hooking it on each end and swinging it out on the passenger side (it’s awkward and bulky). There is a wire harness that is on the right side that can be maneuvered around the case ; it can be left plugged in. Remove the last 10mm nut freeing the evaporator case from the dash. By lifting up on the dash the case can now be removed. Once the case is out, pull back the seals that are glued to the case near the lines. Remove the expansion valve with a torx socket and the 8mm screws that hold the case halves together. 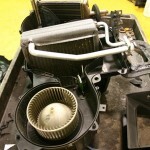 After splitting the case the evaporator and heater core are exposed. Careful not to break the temperature probe that is positioned in the fins of the evaporator. 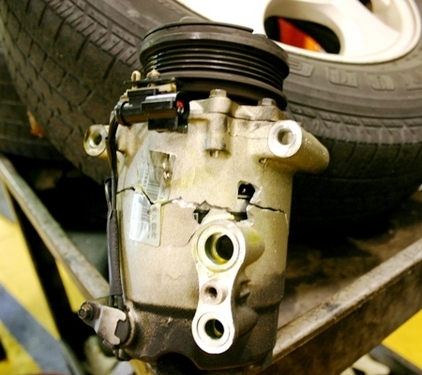 Blow out the case with compressed air, any debris or leaves that end up in the blower can cause noisy operation. Switch the insulating material over to the replacement evaporator and put the case halves back together being careful to line up the doors. Don’t force anything or taking it all back apart again later will be on the list of things to do. Installation is of course the reverse of the procedure laid out above. 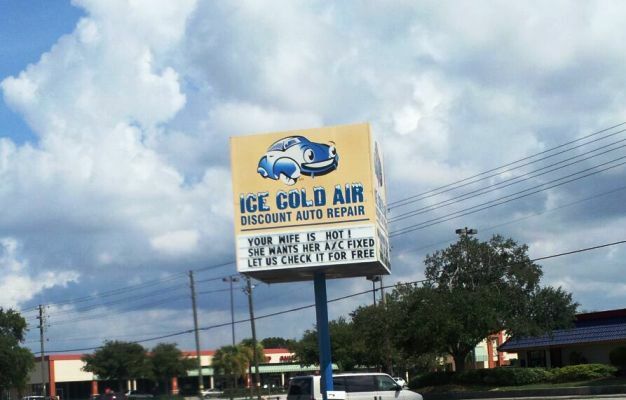 The tips in this article are very basic and NOT intended to be a complete guide for servicing your AC system. Please refer to a repair manual for further instructions. Yes, more than likely. Good Luck.